Silicon Labs introduced a comprehensive software solution designed to simplify the development of wirelessly connected smart meters for electricity, gas, water and heat resources based on the proven Wireless M-Bus standard. Silicon Labs’ Wireless M-Bus software complements the company’s industry-leading microcontroller (MCU) and wireless IC products and development kits for the rapidly growing smart metering and smart grid markets. Wireless connectivity provides scalable, easy-to-deploy communications technology for many smart metering applications. The Wireless M-Bus specification, based on the European standard EN13757-4, specifies seamless sub-GHz RF communication between various types of smart utility meters, data concentrators, mobile readout devices and heat meters (heat cost allocators). Wireless smart meter applications require long life for battery-powered meters such as water, gas and heat meters. The Wireless M-Bus communications protocol requires very little overhead for the small amounts of data used by the meter enabling battery life up to 15-20 years. Proven over the past several years in numerous field tests and deployments in many different countries, Wireless M-Bus has become a widely accepted standard for smart metering in Europe, and interest in the standard is also growing in other world regions. Silicon Labs’ Wireless M-Bus software solution includes a comprehensive sub-GHz wireless protocol stack that supports the S (868 MHz), T (868 MHz), C (868 MHz) and N (169 MHz) modes from the physical layer to the application layer. The protocol stack includes application programming interface (API)-based access for both application and extended data link layers. The software also includes an optional serial command interface to enable control of the Wireless M-Bus solution from an external host processor. The Wireless M-Bus software is available in binary/object code format for Silicon Labs’ Si446x EZRadioPRO® sub-GHz RF transceivers and the energy-friendly, ARM-based 32-bit EFM32™ Leopard Gecko MCU. Physical layer configurations are provided for S, T, C and N modes for evaluation using Silicon Labs’ Wireless Development Suite (WDS). The software package includes complete API documentation, physical layer scripts, test reports, a quick-start guide and PC-based tools for evaluation. Source code is available through a separate license agreement. The Steinbeis Transfer Center Embedded Design and Networking (STZEDN) developed the sub-GHz protocol stack, which conforms to the current Wireless M-Bus specification (EN13757-4), the Wireless M-Bus Application Layer (EN13757-3) and the Application Layer of the Open Metering System (OMS) Group. This robust, standards-based sub-GHz implementation enables smart meter developers to create competitive products that are easy to install and maintain. The STZEDN stack implements all required protocol elements for the Wireless M-Bus standard and additional tools support. The stack has proven interoperability with software modules from leading manufacturers across different protocol layers and is optimized for small footprint, excellent modularity and scalability. STZEDN also offers additional engineering services (adaptation, customization and optimization), training and customer support. 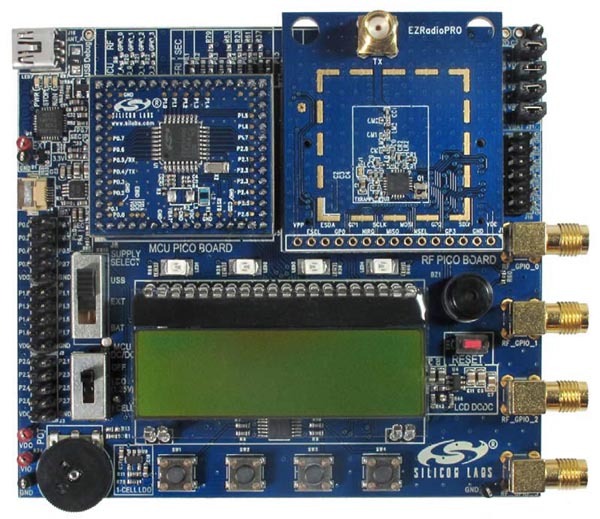 Silicon Labs provides extensive evaluation hardware providing an easy, effective way to demonstrate the capabilities of Silicon Labs’ Wireless M-Bus software solution. One Si4461-868-PDK kit and two EFM32LG-STK3600 starter kits are recommended for evaluation. The Si4461-868-PDK kit includes two 4461-PCE14D868-EK RF pico cards enabling standalone RF evaluation. The RF pico cards must be connected to an EFM32LG starter kit for Wireless M-Bus software evaluation. Connection details are included in the Wireless M-Bus Quick-Start Guide. 4463-PSQ20D169-EK RF pico cards are also available for N-mode operation at 169 MHz. The Wireless M-Bus software solution is available now to customers at no charge.